Step 1: Brine the chops around 2 1/2 hrs before you plan on eating them. You're going to brine them for no more than 2 hrs then they'll be in the oven for 30 min. On we go...In a gallon zip lock back mix a whole lot of water (what the bag can hold or a gallon), 1 cup brown sugar, 1 cup sea salt- or if you have table salt use 1/2, 1 cup apple juice concentrate- thawed, 2 fresh thyme sprigs and 1 1/2 t. whole black peppercorns. Put 4 bone in 1 lb. 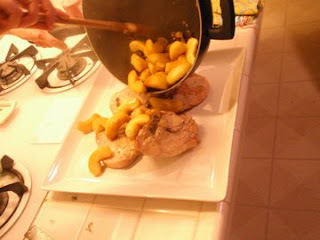 each pork chops in the whisked solution. make sure the sugar and salt dissolve into the water solution... Cover and stick in fridge. 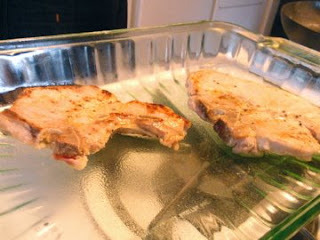 Take the pork chops out of the fridge- pat dry with a towel. 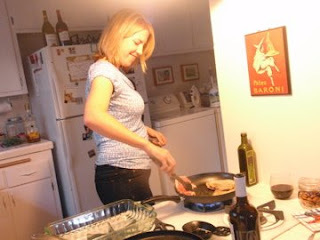 heat some evoo in a skillet and after seasoning each chop with salt and pepper, saute on each side about 4 min. Transfer to a baking dish and bake at 350 for 30 min or until internal temperature is about 140/145. 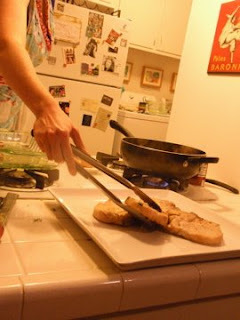 No one likes a dry pork chop so watch this step! 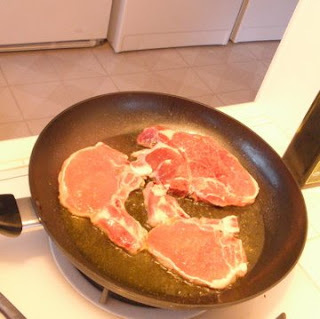 While the chops are cooking melt 2 T unsalted butter. 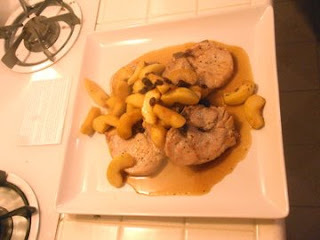 Add 3 granny smith apples- cores and peeled and cut into wedges, and 2 thyme sprig leaves. 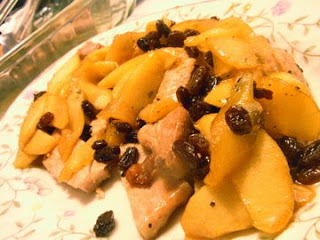 Cook for about 8 min, then toss in 1/4 cup raisins and 3/4 c. apple juice concentrate. Stir in 3 T. brown sugar, 1/4 t. allspice and a pinch of dry mustard. Season with salt and pepper, wake up the sauce with a splash of lemon juice and simmer to reduce the sauce for 10 min. 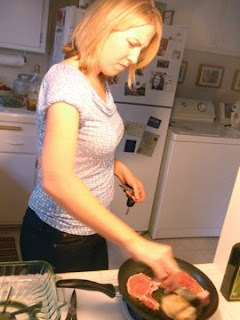 Serve warm over the chops.